Email George Stephanopolos to request CODEPINK's appearance on ABC's "This Week"! Millennials Rise Up Against War! Pro-war propaganda has been ratcheting up for months, worse than during the 2002-2003 buildup to the US invasion of Iraq. A new study by Fairness and Accuracy in Media shows that out of 205 sources on Sunday political talk shows discussing US bombing strikes and other "military options" in Syria and Iraq, only 6 participants, or 3%, voiced opposition to US military intervention. ABC's "This Week" hosted by former (Bill) Clinton staffer, the affable George Stephanopolos, has featured "experts" like General Martin Dempsey, Lt. General Daniel Bolger, General Gary Volesky, Ret. Gen. James Cartwright, former Defense Secretary Robert Gates, and more. None of the retired military men are required to disclose which weapons manufacturers or lobby groups they are working for. Titles of "This Week" often hype the threat: "ISIS Urging 'Lone Wolves' to Launch Attacks" and "Do ISIS and Ebola Threaten the Homeland” are only two examples. It's time for "This Week" to show their audience another point of view. Enter CODEPINK's "A Team" - Alli McCracken, Anastasia Taylor and Anna Kaminski -- who just this week - get it, George? 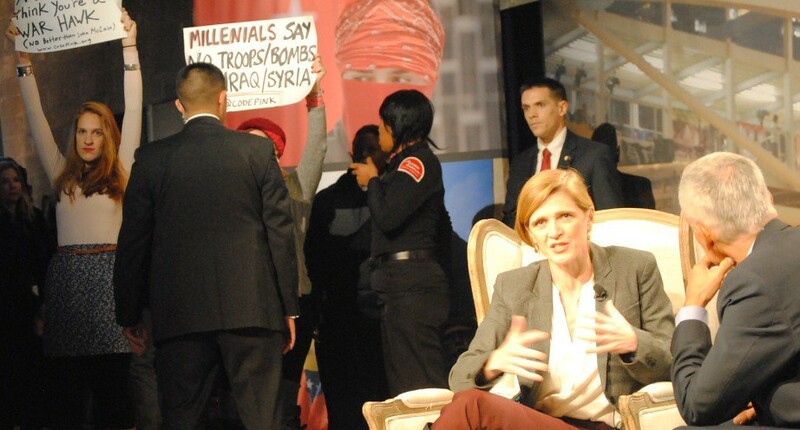 - confronted the war-mongering Ambassador Samantha Power at the Riseup Fusion conference in Washington DC. As a long-time CODEPINKer, I was so proud to hear them speak out. One of my favorite parts of CODEPINK is that we work intergenerationally, sharing skills and providing a platform for young people to make their voices heard. Check out the Youth Manifesto Against War they penned with other members of the CODEPINK youth wing over the summer. Join me to email George Stephanopolos at ABC's "This Week" and ask him to bring on Alli, Anastasia and Anna to his show. As millennials, they offer a perspective that is virtually never shown on a Sunday talk show. As women, they can critique the heavily masculinist war talk and give specifics about how US bombing campaigns, drone strikes and other euphemistically described "military involvement" hurts women and girls, including the use of Depleted Uranium munitions which cause miscarriages, horrific birth defects and cancer. As dedicated advocates for peace, they can spell out the alternatives to US bombing which will ultimately make our country more safe in the long run. The American people are tired of war. It's time for a fresh perspective. A peace perspective. Tell George to invite the A-team as guests on "This Week". Make peace not war - this week and every week!